Here's a brief introduction from my friend Nancy Spivey: "Thanksgiving is a time to give thanks for a bountiful harvest. In these challenging times exploited daily by the media and negative conversations, it is difficult to stay consistently focused on our blessings. Imagine what it would be like to remain in that place of Thanksgiving and gratitude all the time. What a joy it would be! Practicing gratitude has also been linked with positive mental health. " 1. I'm grateful for the blessings God continually showers my way to help me live my purpose. Whether it's nuggets of truth and aha moments or support and encouragement from others, I'm truly blessed. 2. I'm grateful for my husband and good children who make it possible for me to do all I do. I certainly wouldn't be who I am without them. 3. I'm grateful to be able to promote and interact with a phenomenal group of experts at IdeaMarketers.com. I learn so much from them and rubbing shoulders with them is a joy. 4. I'm grateful for good parents who taught me correct principles, encouraged and fostered the development of my talents, and have always been my biggest fans. 5. I think I have the best friends on the planet. They're always there when I need them and ever-willing to share their unique gifts, talents and wisdom with me. 6. I am privileged to work with the young women at church and I love them so much. They are such sweet and fun girls. The other women who work alongside me are amazing. Each one has unique gifts and talents she brings to the organization. I'm constantly amazed by their unconditional love and energy and am grateful that they are strong where I am weak. Dr. Maxine Thompson interviewed me for her radio show on Artist First last night. It was a fun interview and she let me read an excerpt from Savannah Nights. To listen, go here. Last week, my husband and I spent 4 days in Nashville visiting Belle Meade, the Hermitage, and the Parthenon replica. We enjoyed lots of good food and gorgeous fall colors. I also attended Time Out for Women on Friday evening/Saturday. Greg came along as one of the two men on hand to help at the event in cases of emergency. What a relaxing and inspiring four days! Then, I came home and jumped back into my usual routine Monday morning. By that night, I was exhausted and thinking... something's got to change. I don't want to spend my life this way. As if in answer to my prayers, my friend Phillip Davis contacted me Tuesday and asked me to be his guinea pig. As you may know, Phillip Davis and I are co-hosting a teleseries called Radiant Branding starting November 25th. Tuesday he reviewed lesson one with me and asked me to go through the lesson's exercise and get back with him with my results. That evening I sat down with the series of questions and answered them. The result was probably one of the most significant self-discoveries of my life. There was astonishment, tears, laughter, even a touch of embarrassment; but in the end an intense sense of relief and enlightenment. This "aha" was so pivotal and so central to everything I do that I will never be the same. I realized that I'd been trying to obtain my heart's desire in all the wrong ways and with WAY too much effort! Find out more here. Join me for this wonderful audio panel discussion on the power of gratitude so you can tap into blessings, receive abundance, seize opportunities, and find the joy in life. Experts on this call include marriage & family expert Dr. Linda Miles, attraction marketing experts Laura West, relationship expert Nancy Gerber and myself. Gratitude is such an important character trait to develop, I cannot over-emphasize the importance of fostering it in your life. To listen to the call or to download a written transcript go here. Did You See the Wonder in the Heavens This Morning? That got them out of bed! They scrambled for their coats and shoes and headed out the front door to see the wonder. It was a giant glowing circle around the moon. I knew there was a logical scientific explanation for it. There always is, but to me it was a wonder. It was something that made us go, "Cool, I wonder how that happened?" I googled "ring around the moon" and found a "moon ring." Moon rings are caused by light refracting off ice crystals in the clouds. Folklore says it means a storm is coming. Supposedly if you count the number of stars inside the ring, you'll know how many days are left before the storm arrives. We ran back out to count the stars, but by then, the moon ring was gone. See, I knew there was a scientific explanation. But it made it no less wondrous, and frankly, no less symbolic. My little boys were so excited to get to see a wonder, that I decided to grab a teaching moment. Everything in nature denotes there is a God. There are so many signs and symbols of our Savior in creation: sunrise/sunset, tides, and seasons all symbolize Christ's life, death and resurrection. The moon ring was such an obvious symbol that I couldn't pass up the moment to teach my children about God's symbols in nature. The circle is one of the most important symbols there is. It represents a completeness of truth, eternity, and life. At the center of this circle was the luminescent moon -- a light shining in darkness. What better way to symbolize Christ -- the light of the world who shines in darkness and the darkness comprehends it not? (see John 1:5) What better place to put Him than at the center of a circle? Jesus Christ is the central figure at the heart of all truth, eternity, and everlasting life! As we had our family prayer this morning, we thanked our Heavenly Father for sending His Son, and for sending us this wonder to remind us that He is always there, always encircling us, protecting us, and giving us truth and eternal life. So, I issue you the same challenge I issued my children. Whenever you see a wonder, look for Christ. He's always there. Do you remember the story about Jesus walking on the water, and Peter asking Him if he could do it too? Peter got out of the ship and started walking on the water toward Jesus. how horrible everything is on a minute to minute basis. To a great degree the wind is the media. Whatever negative it doesn't amplify, it manufactures! Just because it's on the news doesn't make it true! In a conversation with my friend Lisa Rae Preston, she made a profound statement. She said, "We don't live in a free country anymore. Our dictator is the media." Think about it. There is a lot of truth to that statement. To the degree to which we pay attention to the media, we are enslaved by it. To the degree to which we believe it and live our lives by it, it creates that reality in our lives. When they were really ramping up about how bad the economy was, do you know the first places that were suffering? It was the local charities that provide food for the needy. People saw financial troubles on the horizon and the first thing they did was stop giving. That is the LAST thing to do. Did you ever once see a picture of Jesus with tight-clenched fists? Did He ever say, "Go away"? Did He ever lament, "There's not enough food for you here"? Rather he said, "Give, and it shall be given unto you; good measure, pressed down, and shaken together, and running over, shall men give into your bosom. For with the same measure that ye mete withal it shall be measured to you again" (Luke 6:38). When things get difficult, it's not time to contract and withdraw (become afraid and sink). It's time to reach out, lift, give and bless! There is plenty and to spare on this planet. God created it that way. Everything in nature is about abundance. It's when we start listening to the howling wind and watching the waves whip that we go against what we know is true. That's when we start to sink. That's why I'm asking you to join me in turning off the negative news! That's right. I challenge you to turn off the negativity for a week. When you do, you'll see you don't need it anymore. You might stretch it into a month, or even into a way of life. I haven't watched the news in years. Sure, I've seen a bit in passing here or there, but I haven't actively watched it in over a decade. People around me do, and they keep me well informed -- too informed. I've heard too much about how bad things are, and I don't even actively feed my brain with it! So I challenge you, for one week, turn off the news. Don't watch those contentious talk shows that abound. Flip the channel on the radio when it goes to a news break. Walk away or change the subject when other people start passing along the negativity they've heard. Don't talk about it yourself. If you need weather updates, watch the Weather Channel or go to www.weather.com . You can even install the weather on your desktop and know at all times what the temperature is. It'll warn you if there's a REAL storm coming. You can also subscribe to www.Congress.org to know what issues Congress is voting on so you can write your representatives and senators accordingly. Fast from negativity for one week, and replace it with good things. I predict that as you do this, you'll feel a sense of peace, a sense of liberation, and a feeling of gratitude for the good that surrounds you. Focus on the good, and you'll find more of it. If we keep focusing on the negative by watching the media, we're going to find more and more of it until we're overrun by it. Join me in this campaign I'm calling, "No News Is Good News." Forward this to your friends and family. Let's vote with our eyeballs, and tell the media we're sick of their negativity and mind games. We're ready to ACT for ourselves and not be acted upon any longer! Let's start a revolution against the dictator media and proclaim our liberty today! Dolly Parton once said, "Discover who you are and do it on purpose." I love that! It's such a phenomenal way to live your life. It's also a great way to do business. So many people struggle to market themselves using all the latest tactics the gurus suggest and still fall miserably short. It's not that the tactics are bad, it's that most people use them without ever getting clear about what it is they're marketing. Until you lay a foundation of who you are, what you stand for, and how you intend to make the world a better place with the products, services, and messages you deliver, marketing is going to be a struggle. Once you get clear, decisions come easier and the right people, events, and circumstances start flowing toward you -- especially if you convey that clarity in everything you do. Everything about you and your marketing materials should radiate this "brand of you." Sound like a tall order? It really is easier said than done. It takes some real thought and some foundational soul searching. Most of us don't even know where to begin on our own. For example, while it's intuitive for me to see the core message for others, I have a tough time getting clarity for myself. There's one person who has been critical in me finding the clarity I searched for for years. That person is my friend Phillip Davis of Pure Tungsten. Phil has a knack for cutting through all the information overload, clutter, and scores of interests an individual may have and getting to the core. What's more, he has a way to teach you how to do it for yourself! 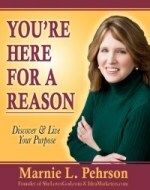 Recently I had Phil on one of my Mondays with Marnie calls to talk about this. The response was so phenomenal that Phil asked me to co-host a 4-week telecourse with him called Radiant Branding: How to Discover Your Brilliance and Let It Shine! We set up a site at www.RadiantBranding.com . You'll want to visit it if you crave the kind of clarity that wakes you up with a sense of possibility, knowing that your gifts, talents and abilities are the perfect match for those who would greatly appreciate them. On this site you'll be able to listen to the call that started it all . . . it's on the right hand column, midway down the page. You'll also be able to sign up for the course that starts November 25th. My guest today for Mondays with Marnie is a real mover and shaker. :) Milana Leshinsky is a marketing adviser to coaches, entrepreneurs and experts, helping them build a high-income business, with multiple streams of revenue. In this call you'll learn different ways to "package" yourself and your expertise for maximum results. We'll also record the call, and you'll be able to listen to it in the member area of Mondays with Marnie. To become a member for free, go here.